Phalsa (Grewia asiatica) is a summer fruit rich in pigment antioxidants. Phalsa looks like a berry but it is actually a stone fruit (Drupe) that has very little flesh but verr flavourful. 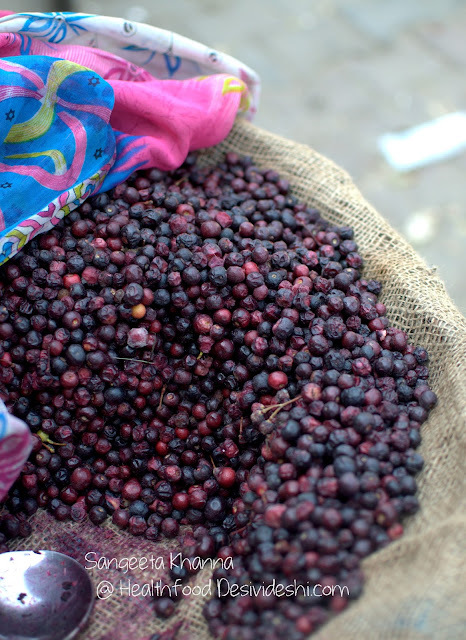 It is a popular street snack tossed with black salt or herb salt and the phalsa sellers can be seen carrying the 'berries' in a basket during summer months all over north India. Since the berries rot really fast there is a remote chance for these to reach supermarket isles. But a few street vendors will always keep bringing phalsa to us I am sure, there are people who forage such berries and make a living out of it. Good for conservation of such lesser known native fruits. It's too hot here in Delhi and we are practically living on cooling foods and drinks, be it salads or sharbats or just plain lime water, nimboo paani, chilled slices of watermelons and muskmelons are mostly for lunch and light snacking throughout the day. 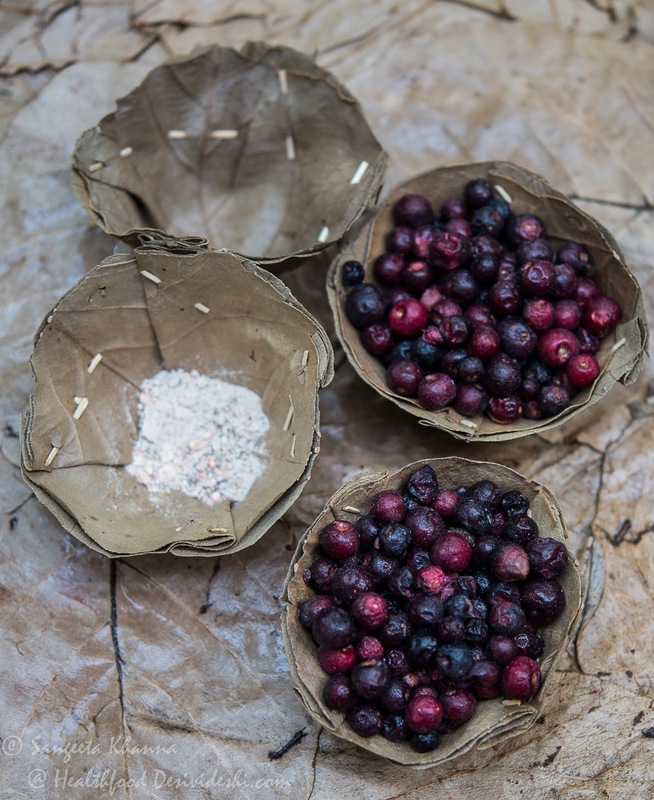 As I mentioned, Phalsa or Grewia asiatica is a tropical stone fruit (Drupe) which is tangy and sweet with a unique flavor, it's taste pairs well with kala namak or black salt, some people call it pink salt too. The fruit has a small stone inside which can be chewed and I prefer to chew on it whenever eating the berries in a salad like my mango salad or as it is with black salt. To make phalse ka sharba, mix salt and sugar to taste to cleaned phalsa and macerate it without adding any water. The juices will come out when you mash and macerate the berries.Leave it for 10 minutes, then add water and pass through a strainer while rubbing the pulp through the strainer surface. For making one liter of phalse ka sharbat you need about 250 gm phalsa, 4-5 gm black salt and about 50 gm sugar if using. 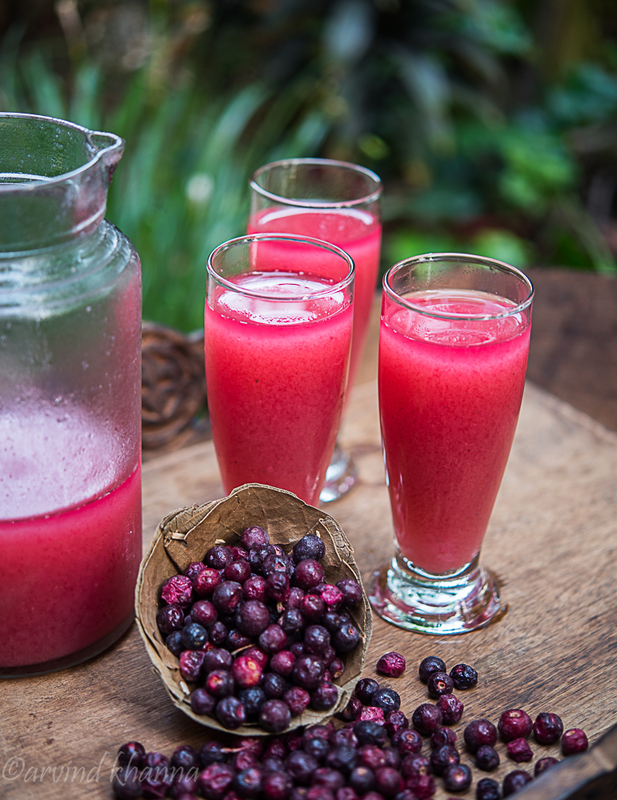 Or process the phalsa in a mixie jar or food processor and pulse to make a puree of the fruit. I add equal quantity of thinly slices beets to this pulsing mixture sometimes. Add chilled water once a paste of formed, pulse again, and pass the mixture through a sieve so the stony seeds are separated. Add ice cubes or more chilled water, pink salt to taste, add sugar if required and serve chilled. 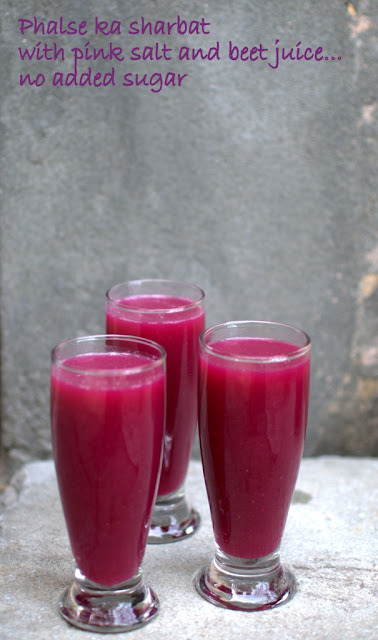 A cup of phalsa berries and half a cup of beet slices result in 3-4 large glasses of thick smoothie like sharbat. You can always dilute it but then you might require a sweetener as the natural tangy sweet flavor of the berry will be diluted. The sharbat can be refrigerated for the day. Cooling for summers, cleansing for the system and very nutritious as the fruit is rich in minerals and antioxidants. Wow...what a sharbat I do have it when I am in india..never tried to make it here..
And I like the idea of more salt and less sugar. 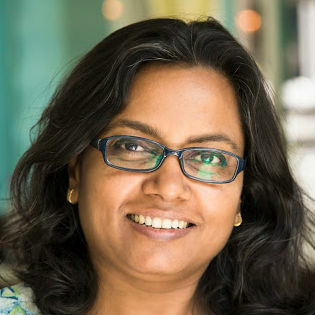 You are right that Varsha is bubbling too much and brimming all her happiness over to us...I adore her for that. You have bestowed a well deserved award on her and it's so sweet of you..
A delightful drink! This would be perfect as we are finally getting some hot weather here. Never had this before. Used to drink sugarcane juice like mad. Can't wait to get back and then you can make me this cooler and cupcake and kele ke kofta. Never seen it before-but I love all kinds of berries,so I'll look out for them when we get back!